Luke brings us the story of Jesus healing a paralytic man. This one is told in all three of the synoptic Gospels. In verse 17 of chapter 5, Luke is illustrating just how much Jesus’ notoriety had increased following the cleansing of the leper. Among those who were listening to Him teach were Pharisees and “teachers of the law” (scribes) who had come from every village of Galilee and Judea, as well as some from Jerusalem. So the size of this gathering was quite substantial. 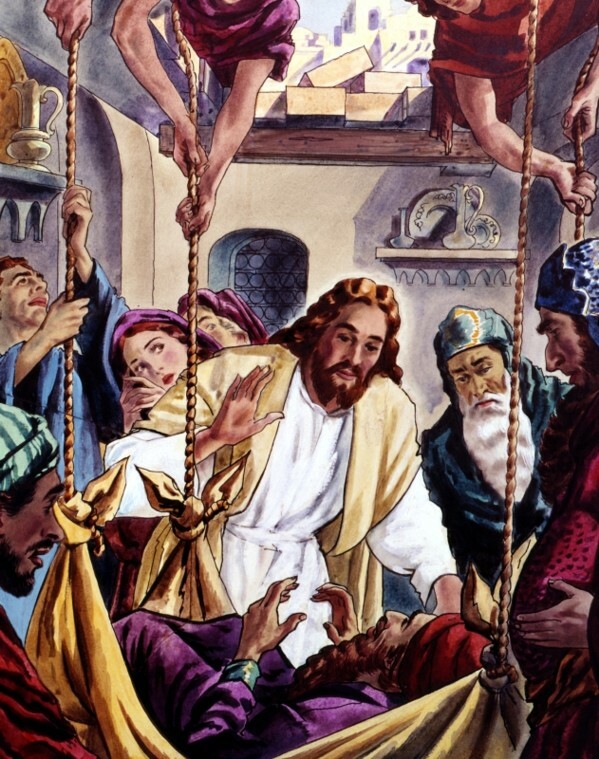 Jesus healed a paralyzed man who was let down to Him through a roof (Matthew 9:1-8; Luke 5:12-26). Each of the Gospels holds some details not contained in the other two concerning the account of this event, which only serves to make the independent accounts more credible. Though Luke does not say what city Jesus is in at this time, by reading about it in Matthew 9:1-8 and in Mark 2:1-12, we find that He is “at home” in Capernaum. Capernaum was where He lived then – at least “home base.” Luke does not tell us at what home or building He was teaching when this occurred. Wherever they were, the crowd was so large that the men who had brought a paralyzed man on a bed could not get through the thick of it. So they went on the roof and removed enough tiles to lower the bed down to Jesus so that He could heal the man. Surely, the men that went to all this trouble were relatives of the paralyzed man. Their desperate act of faith certainly got the attention of Jesus. When He told the paralyzed man that His sins were forgiven, it provoked a reaction from the Pharisees and scribes that were present. They were thinking that Jesus was guilty of blasphemy, since only God can forgive sins. It was the thought Jesus expected from them, and He then demonstrated His divine authority by having the paralyzed man walk – not just get up and walk, but carry his own bed with him.